In this picture book a young boy describes his dad and all the amazing things he can do, from walking a tightrope to fighting giants. Dad is funny and wise and most important of all, loving. This is a book which celebrates the love between a father and son. All the highly imaginative boasting show just how much this young child admires his father. The pictures are colourful and full of detail and humour giving lots to talk about together. Before you start reading the book aloud look at the cover, what might this dad be doing? Can you make that face too? Read the story aloud to your child, taking time to talk about the pictures as you do when your child would like to. Talk about anything your child is puzzled by, this may be phrases such as ‘daft as a brush’ or the very strange things happening in the pictures, eg tartan toast, dad always in his dressing gown, dad with the head of an owl or turned into a fish. Can you make funny faces together like the one dad is making on the cover or other funny faces? Children could look in a mirror to see what they look like. Take turns choosing a page to mime some of the things we find out about dad eg that he can walk a tightrope. See if you can guess what dad is doing each time. Play a word game together taking turns to boast about (an imaginary) dad. My dad is as fast as a ….. My dad is as big as a….. My dad is so clever he can….etc. Print off the game sheet onto paper or card. Cut into individual cards. Read the word cards to your child and match with the pictures together. Then muddle them up and see if your child can read the word cards themselves, helping them if they need you to (by for example matching with the words in the book) and then pairing with the pictures. Talk about all the things your child’s dad, grandad or uncle can do, this could be true (eg my dad is a wonderful cook or great at reading stories) or very imaginative! 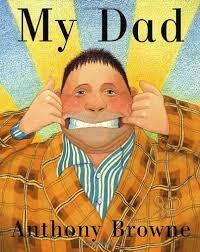 Children could make a zigzag book about their dad with a picture and sentence on each page.